My introduction to antler hunting was a parody. 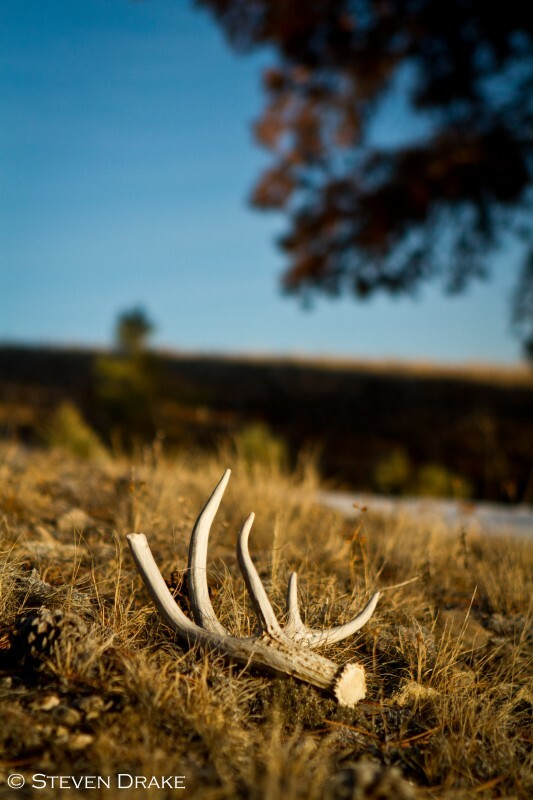 Seventeen elk sheds the first year and ten the second led me to think I had found a honey hole. Assuming the following years would produce equally high yields I sold many of them to a local chandelier builder. $350 was the reward – I had hoped for $900. The secret spot was discovered the third spring. Snowmobiles and four-wheelers had scavenged the place. I witnessed two individuals chase down a six point bull on their four-wheelers, hooting and hollering, trying to get him to drop his antlers. Their arrogance and lack of respect disgusted me. Ethics should play a role in all types of hunting. I’ve been shed hunting for eight years now. 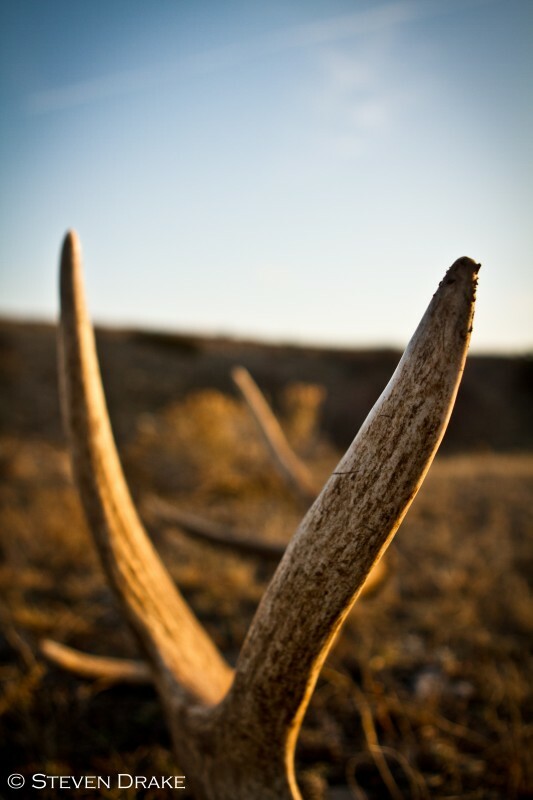 After the grandeur of the first two years, I’ve come to value the antlers I find a whole lot more. The sentimental value of each one, even if it’s chewed up, has more worth than the money they fetch. 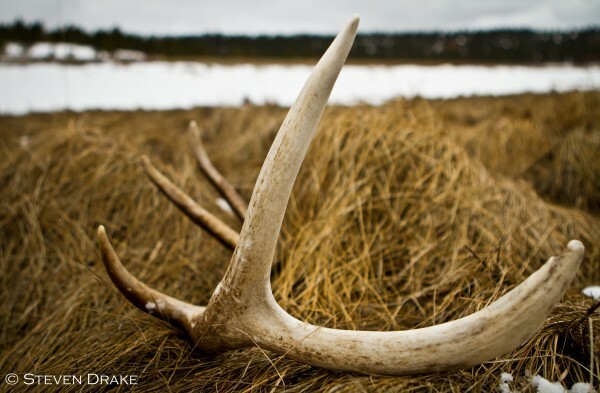 Although the chewed up sheds usually do become dog bones. My house is loaded with deer and elk antlers. They are the primary decorative piece, despite my family’s and roommate’s objection. In my kitchen alone there are twenty two sheds on top of the cupboards. 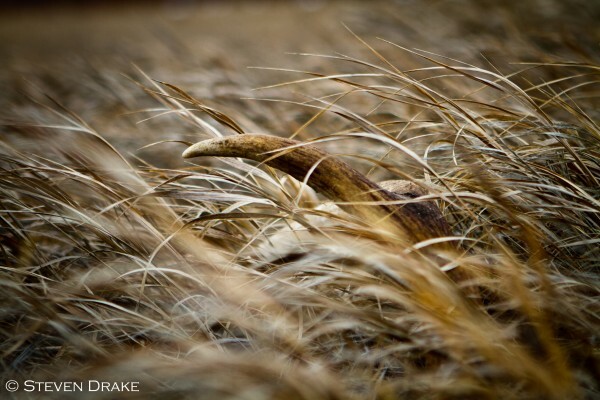 During the fall archery season I’ve learned there are still abundant opportunities to find antlers. 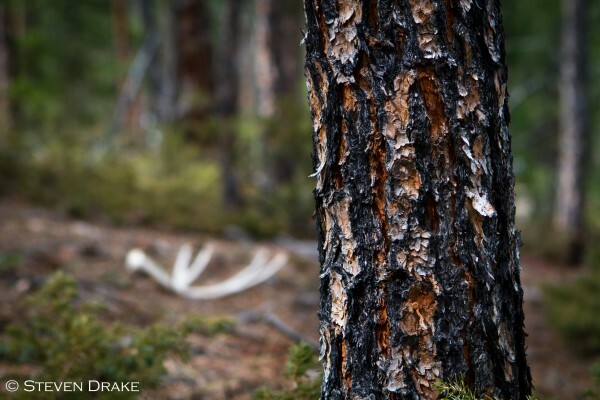 Opening morning of my first day ever archery hunting, my dad and I were sneaking through the timber when he abruptly whispered, “STOP!” I froze, peering through the timber for what I presumed was an elk. My dad then said, in a normal voice, “No, look down.” One more step and I would have tripped on the most unique elk shed my dad or I has found to date – A huge split G2 seven point. 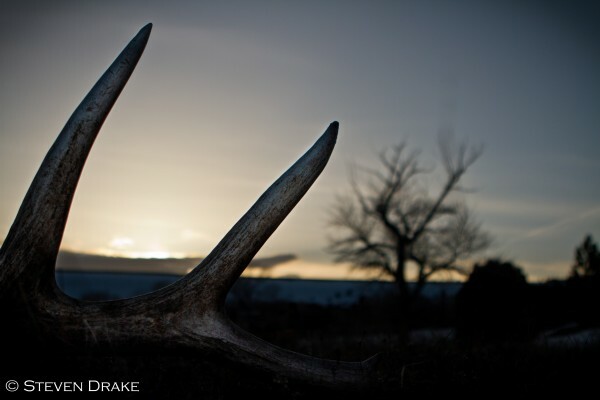 That evening we called in a six and a seven point bull. 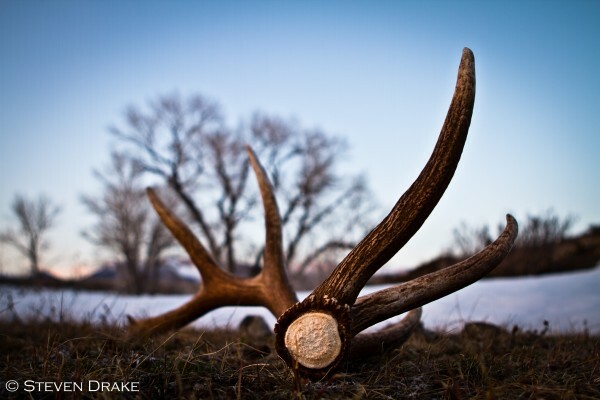 It was quite an opening day, one that would hook most anyone on archery or shed hunting. 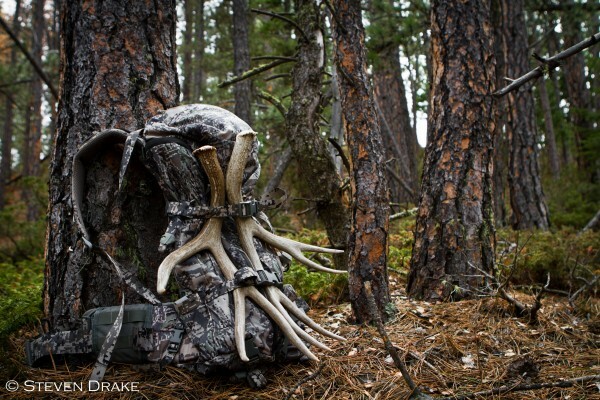 My version of a perfect antler hunt was realized this spring. 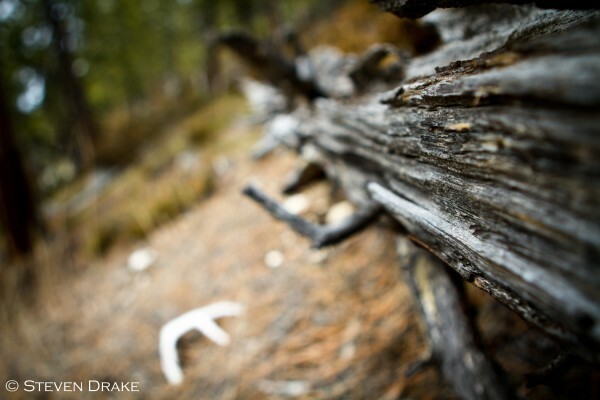 I spotted what I initially thought was a pine branch in a distant coulee – my binoculars proved otherwise. Despite having just eaten an entire Hamburger Helper, I sprinted wholeheartedly to lay my hands on a beautiful mature bull elk shed. I was in the middle of nowhere, no one was there but me, and I still sprinted. The reaction was uncontrollable. No matter how often it’s done, the experience of putting your hands on the byproduct of a game animal that shapes many of our lives remains gratifying. When rewarded with such a treasure, gas money, miles put on foot, and the opportunity costs associated with pursuing such a passion are forgotten.